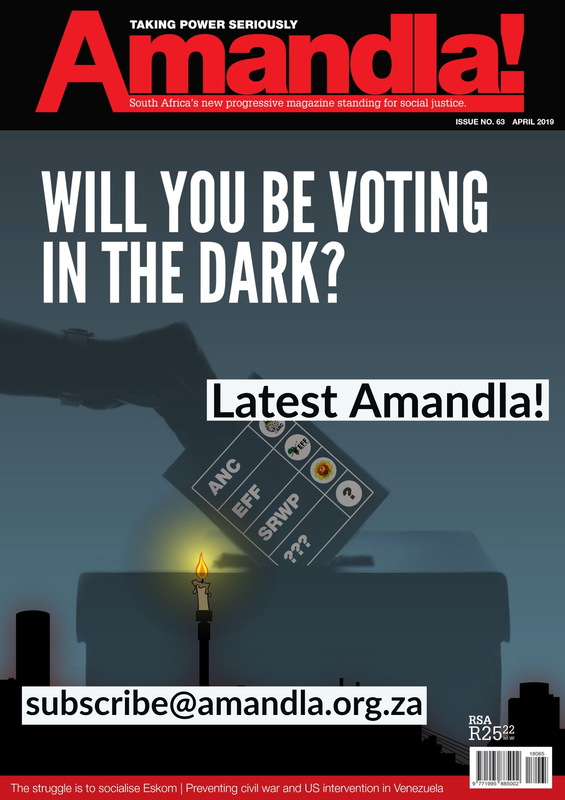 Amandla! (A! ): At Numsa’s Special Congress in December you voted to hold socio-economic strikes, the first of which is coming up on 19 March to oppose the Employment Tax Incentive. Could you describe what a socioeconomic strike is and why Numsa is opposed to the tax incentive? Irvin Jim (IJ): I must say that the socio-economic strikes are part of a broader agenda and part of the struggle we have been waging for the past 20 years now. It is criminal that we have a triple crisis of poverty, inequality and unemployment in a country that is very rich in minerals and energy and everything else. South Africa is a rich country; it can feed all of its people. It’s a crime that as we speak we have 26 million people who are basically ravaged by abject poverty, and I must say that 25 million of those are black and African. We have always known what needed to be done. For instance, we said government can create jobs by doing a couple of things: by increasing tariffs through bringing back capital controls, and by stopping money from leaving the country through capital flight. We have continued to remove exchange controls almost every year, and money is leaving the country. We have always said the government should implement fully the freedom charter. From where we are sitting, it is suicidal to allow the continuation of the special type of colonisation we have in South Africa where the coloniser is inside the country. Basically you have white monopoly capital, corporate multinationals and the white population who dominate the South African economy. The freedom charter in this case is very clear. It says mineral wealth, the soil, banks and monopoly industries must be transferred to the ownership of the people as a whole. That is the cornerstone for non-racialism and non-sexism. To leave the existing economic conditions intact is basically to allow racial supremacy to continue. The biggest challenge that we have really failed at is transforming what we call the minerals, energy and finance complex. We’re still seeing the old extraction of minerals, where the beneficiaries are the mining oligarchy and finance capital. Instead of targeting jobs, the reserve bank is targeting inflation, and interest rates are being kept very high because we allow money to leave the country. So the only way of attracting foreign direct investment is to keep interest rates very high. But this way, you are attracting hot money, which basically goes into the stock exchange. It does not translate into productive sectors of the economy. The Employment Tax Incentive Bill is basically a cheap attempt at trying to create jobs by bribing young people. These are the sons and daughters of workers who have suffered to send their children to school. Instead of that person being trained to be paid a proper living wage, government says we will incentivise companies to pay those young people. But we know what will happen. What companies will do is use those young people to displace existing workers who are paid a living wage. This is why we took the decision to embark on socio-economic strikes, to challenge this attack. This is an attack against hard-won gains of workers. We know that between the right wing Democratic Alliance party and the government’s National Development Plan, which is a new plan that the ANC has put out, there’s suddenly a common alliance. They are saying that the people who are responsible for poverty, unemployment and inequality are the few workers who have got jobs. There is a belief that they have become spoilt, and that we need the outsiders to come into the workplace. They see the mass of poverty and unemployment of South Africans as a political accumulation strategy where basically you could pay them terrible wages and conditions as long as they have a plate of food. We think that the race to the bottom is not the strategy that South Africans should adopt. A! 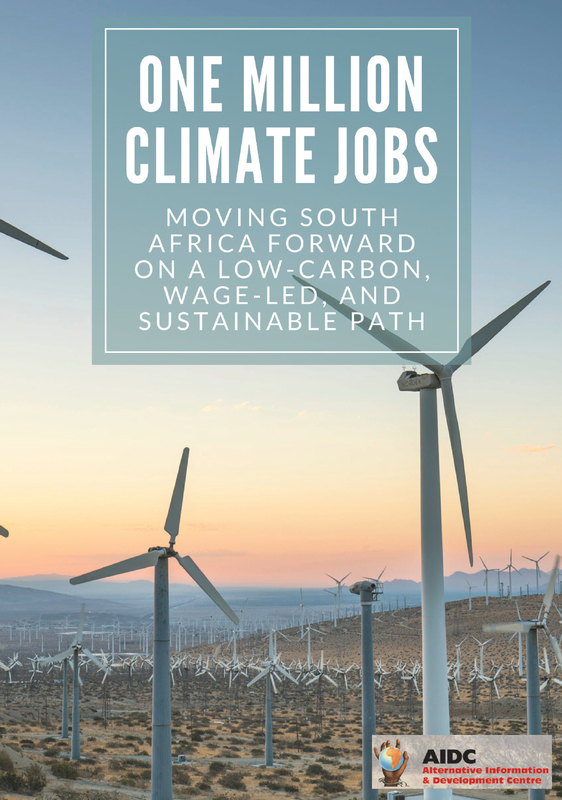 : South Africa has experienced rapid deindustrialisation in recent years and the growth of informal and casual forms of work. What does Numsa see as the solution to the decline of the manufacturing sector and how can decent work be created? IJ: If you bring back tariffs and capital controls, you will stop money leaving the country. We’ve allowed South African companies to list in London and Melbourne, which has basically led to serious deindustrialisation in the country. But there are a couple of things worth noting: We’ve got steel in South Africa, which is an important sector. Arcelor- Mittal is a very strategic company which used to be ISCOR [a South African parastatal] in the past. That company used to make available cheap steel to downstream industries to create jobs. We used to have the company Sasol, which was state owned, but suddenly Sasol is selling polymer chemicals above market prices. You could’ve used those polymer chemicals to create a new plastics industry to create jobs. So we can create jobs if there is political will. The biggest challenge is that we have a government which has not taken the decision to say that manufacturing matters and that our own minerals, before they benefit others, should benefit our own country first by creating jobs. A! : One of the problems for unions in South Africa and internationally has been organising outside traditional sectors and particularly among precarious workers. How does Numsa plan to mobilise these individuals? IJ: Numsa has been in the trenches to fight against precarious work. We have fought against labour brokers, and that is another issue that brings us into conflict with the ANC. We expected that the ANC must ban labour brokers, but instead, they regulated labour brokers, and in the new National Development Plan, they basically see them as replacement labour, which they incentivise. That’s basically allowing blood-sucking parasites to continue to accumulate at the expense of poor workers. We have not dealt with the fact that there is a colonial wage in South Africa. We need a national minimum wage, and labour brokers are basically a new form of super-exploitation. They are undermining the hard-won gains of workers that were secured during the days of apartheid. Numsa will continue with the struggle to ensure that we deal with labour brokers. In the auto sector I must say we have already succeeded as well as in the tyre sector. And in the engineering sector we are going through the next round of negotiations this year. It’s a continuous battle that we have to take up in every round of collective bargaining, sector by sector. A! : How does Numsa view the land question, and what role can the redistribution of land play in tackling rural poverty? IJ: Today 87% of land is still as it was during apartheid. And I don’t think we’ll be able to address the land question or the property question because section 25C of our bourgeois constitution says that the state can expropriate, but also that if the state decides to expropriate it must first pay the market value of the property. The white South Africans who own the land got it through the barrel of a gun, but to reclaim that land you have to pay them its market value. So you can ask the question: why did people die for our revolution if what was taken was not brought back under the ownership of the people as a whole? The land question is a class question in South Africa. It is a property question, which must be resolved. In our view, the constitution needs to be changed. We are not doing it only in order for blacks to have the land. Land must be accessible to both black and white, and the state must be the custodian of that land and support you when you become productive. But we know what has happened. Many of those people who have been given land are not productive, and the irrigation schemes and infrastructure that used to be there has been allowed to collapse because the state has not intervened. People are given land with no solid support to make sure that they can use it productively. A! : What is at the heart of the divisions within Cosatu today? Do the rifts derive from former Cosatu General Secretary Zwelinzima Vavi’s suspension last year, or are there other unresolved political differences between the unions? IJ: What Vavi championed when he was at the helm is what Numsa continues to champion today. Quite frankly we embarked on a process in 2007 when the ANC government was under President Thabo Mbeki. We felt that we needed change, but not just a change from Mbeki to Jacob Zuma. We wanted fundamental change. We wanted to do away with the government’s macroeconomic framework called GEAR , which failed on all fronts to provide growth, employment or redistribution. That’s really what was behind the removal of Mbeki, and our mobilisation to get Zuma into power. But all that Zuma did after taking power was to co-opt communist party leaders into government and continue neoliberal policies that failed to challenge white monopoly capital. So at the centre of the conflict in the federation is that Numsa and some Cosatu affiliates, and there are many, want to make sure the freedom charter is fully implemented and that the government acts decisively in the interests of the majority. However there are some in the federation who have been co-opted and who have been won over by those who want the status quo to continue. We need a special congress in Cosatu so we can work out these differences. Vavi is just a person who symbolised the expression of those particular challenges that confront us today. It is not about an individual. It’s about the programme, it’s about the revolutionary agenda that we think them country is desperately in need of. A! : One of the most significant resolutions at the Numsa congress was the decision to launch a United Front in alliance with other civil society groups. Could you describe how Numsa envisions the creation of this United Front and what it is eventually leading towards? IJ: One issue that must be understood is that Numsa has faith in the working class. We believe that the working class is the motive force in history. And we think it is high time the working class organises itself as a class for itself. However, we are not in a rush. We have taken a resolution that will be phased in, and the first phase of our resolution is that we must go all out to launch a United Front almost like a UDF [United Democratic Front] style formation, which includes street and area committees and civil society organisations − those organs of people’s power that were important in the 1980s. After 1994, we were basically demobilised by corporatist institutions. We are now saying it is high time we organise ourselves and mobilise the people. We are leaderless right now. Basically every day there are service delivery protest and workers have become more militant because they carry the burden of the mass of South Africa that is affected by poverty. We are saying let’s launch a United Front and as we launch it we will study and research different parts of the world such as Latin America. We think that within no time we should be in a position to basically organise and launch an independent party that can champion the interests of the working class, and which would contest elections at an appropriate time. We need a vanguard party which speaks in the interest of the working class, which raises levels of consciousness, which agitates and educates the working class. We need a vanguard party that explains to workers that the struggle for wages is a narrow struggle. Workers need to understand that we’re not just looking for a loaf of bread, but the whole bakery. It is also important to add that Numsa will not cease to be a trade union and that it must maintain its legal status and continue to recruit workers and mobilise them. But Numsa will continue to be a catalyst for the establishment of an independent vanguard party. We have been a union that has basically survived because we prioritise worker control. It is a union that is run on the basis of mandate and accountability. A! : What is the relationship of Numsa to the Economic Freedom Fighters, and is there a natural alliance between the two organisations? IJ: Julius Malema and those other former members of the ANC Youth League were dismissed for saying the freedom charter must be fully implemented. Numsa will not be spared either from attacks as it calls for a radical programme. We are very similar in that sense. But we have not taken any decision to work with Malema’s Economic Freedom Fighters. Numsa has taken the position to not support any political party currently. Hi Mr IRVIN JIM Iam concern worker @ airchefs catering company. write now I had numsa is a majority but like today 21july there are some interview but I don’t see numsa shopsteward instead I saw sataw shopsteward.Another thing can u please come to air chefs company please sir I will be happy if u can come. there are lot of problems that if u can come it can be resolved. I trust u comrade.